In July 2017 Food Lore Community Interest Company was created. Now Mrs. Mash is part of a social enterprise with a mission to use stories and songs and food activities to help as many people as possible to enjoy good food and the benefits of eating well for health. How it works is that the profits from our work go back into providing sessions to organisations with people who may not normally get to access to good food experiences and education.This means the more visits we do to nurseries, schools and other events the more we can provide sessions making soup and sharing stories that get everyone in the mood for good food! We are keen to work with other organisations who share our dream of a Scotland where we all eat more vegetables and fruit and feel healthier and happier as a result! If you would like to know more do get in touch. 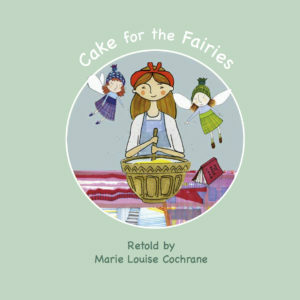 To help raise funds and support others educating around food, we have produced a picture book “Cake for the Fairies” beautifully illustrated by Hilary Macaulay and a cd of food themed and Scottish songs for children and families. These will be available from the end of October this year.